Play real money casino games on your phone or tablet? If you're South African, now there’s an App for that! 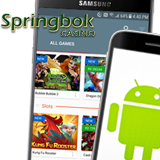 Springbok Casino has just launched a free App for Android smartphones and tablets. It's the quickest and easiest way for South African Android phone users play mobile casino games. Installing the App is also simple. New app for Android smartphones and tablets is most convenient way to access mobile casino games. To install the Springbok Casino App for Android phones and tablets, go the App page on the casino’s website and tap the Download Now button. The App just takes a moment to automatically instal and then you're ready to logon (or register) and head straight to your favorite slots and table games! When you access the casino on your phone or tablet, you'll see a lobby designed smaller screens. The buttons are big, to make tap-and-swipe navigation easy, and the games themselves are designed to make the most of the smaller space. You can still play mobile casino games without installing the app. Just go to the casino using the browser). But most people find it much more convenient to use the App. At South Africa’s favorite online casino, all games are played in Rands and customer service is available in English or Afrikaans. Bitcoins can now be used for casino deposits and withdrawals.